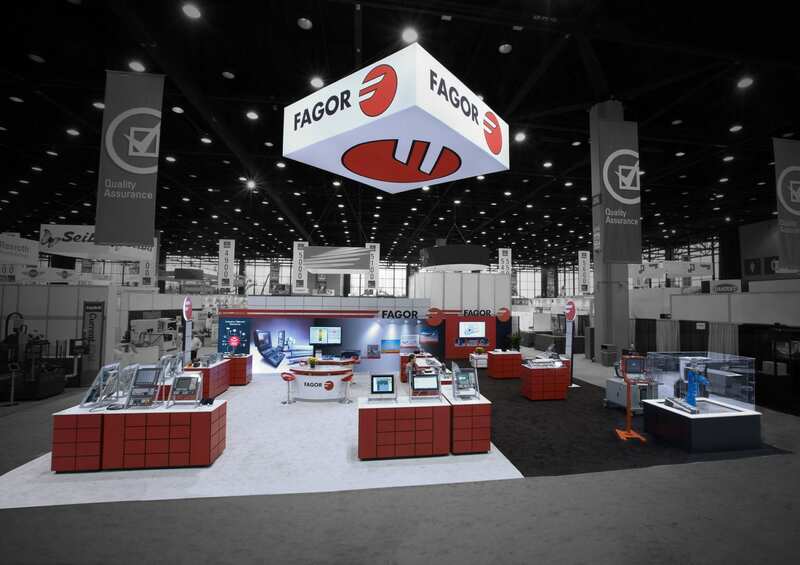 Our trade show display ideas will impress and inspire you for your next exhibit. You can have the greatest company or product the world has ever seen…but if you’re not innovative in your approach, you won’t be able to attract foot traffic. You need a display that draws people in and communicates your commitment to innovation and quality. People may be engaged for a moment while hearing about your product or seeing a demo of it. But they’ll remember that engagement if you somehow manage to involve them directly. Think of any angle that you could possibly use to stimulate personal interaction. Are you part of a gaming company that’s advertising an upcoming release at a trade show? Rather than just showing recorded gameplay for people to watch, why not let them play through the first few minutes of the game? Again, do anything you can to stimulate direct interaction or involvement. 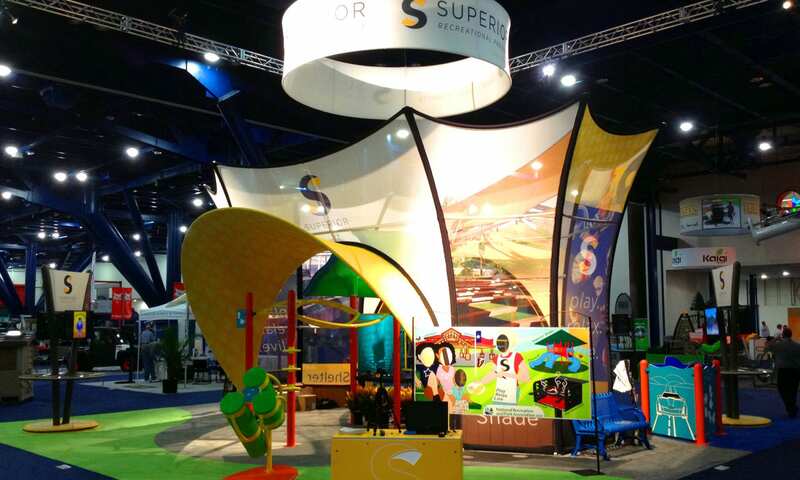 It’s one of our favorite trade show display ideas because of its simplicity and high ROI. One of the best ways to get noticed and draw crowds at trade shows is to take up a little bit more space than you need. The key is to do so in a way that doesn’t infringe on anyone else’s space. A great way to accomplish this is vertical construction: maximize your space upward. This is an especially great idea if you’re at the show to promote something abstract or difficult to visualize. You could, for instance, have a futuristic-looking vertical archway over your exhibit. This would simultaneously catch more eyes, draw more traffic, and give you a tech vibe — all in one elegant move. Another point that gets overlooked when it comes to trade show display ideas is the issue of lighting. Your decisions around lighting have a huge impact on the overall atmosphere of your exhibit. The trick is to make sure your lighting selection attractively complements the nature of your product or company. Do you make fine artisanal chocolates? You certainly wouldn’t want harsh or industrial lighting. You’d naturally opt for something softer and more finely distributed. Perhaps you’d even arrange some string lights for added ambience. Plan accordingly. There’s no quicker way to sabotage your exhibit than to ignore the little things. Trust us, they add up quickly! If it’s in line with your company and product, consider displaying a few large chalkboards around your exhibit with drawings relevant to your niche. Perhaps you’re there to advertise your luxury flower company. Have a professional artist make chalk drawings of a few bouquets you’re particularly proud of. This is also a great chance to meld education and aesthetics. You could combine attractive chalk drawings with relevant facts about your product or industry. And as an added bonus, you’ll be providing a subconscious connection to your visitors’ youth — the last time most of them will have seen a chalkboard was back in school! Depending on your niche, this could play to your advantage. Putting a wall of some sort in the direction that most of your foot traffic will be coming from is one of our more innovative trade show display ideas. It accomplishes a few different things simultaneously. For one thing, it gives you the advantage of grabbing attention. After all, who would expect someone to wall themselves off at a trade show? The other benefit it offers is the chance for aesthetic creativity. Are you in the food industry? Design your wall to look like the outside of a restaurant or the entrance to a marketplace. Having a giant replica of your product at your exhibit is a great attention-grabber. For one thing, it eliminates all ambiguity around what you’re offering. A few of our favorite examples from the last few years: a model electric engine, a giant cell phone, and a huge replica of a water droplet from a company that made reusable water bottles. The key with this idea is to make sure your replica is both visually clear and aesthetically attractive. If at all possible, be your own product demo throughout the entire trade show. This one is a little bit more difficult to execute, but hugely memorable and impactful if you can pull it off successfully. For instance, does your company make mini treadmills? Why not walk on one yourself throughout the trade show as you talk to visitors? Or perhaps you make standing desks. Why not be standing at one while you talk to visitors, and have one out for them to try as well? One of the more innovative displays we’ve seen lately revolved around a shipping palette. The company made small-batch coffee, and had repurposed one of its own shipping palettes. It was nothing fancy, but that was the whole point. It was simply an upturned shipping palette with their company name and logo, and a few string lights around the top. It was innovative, intimate, and perfect for what they were advertising. Would your product be suited to a similar presentation? Consider incorporating a large picture of someone using your product or service. People are naturally drawn to action or motion, both of which can be beautifully portrayed in a skillful image. This technique is even more powerful if you can make the image say something positive about your company. What do you want to be recognized for and associated with? Consider those points carefully before deciding on an image to use. And remember: stick to one or two for maximum impact. Human beings crave facts. We make decisions based on them (or our perception of them at least), and almost nothing carries more purchasing power with trade show visitors than a well-selected fact. But this tip goes beyond the basics. Instead of just highlighting a fact in writing, develop an infographic around it. Need an exhibit idea for your home security company? Consider an infographic displaying how many people across the country use your services. This one’s a favorite of ours. If you can, incorporate AV into your exhibit that plays a continuous loop of content related to your brand or product. This gives you a chance to creatively show visitors aspects of your company they might not otherwise see. You could even show aspects of manufacturing that are particularly interesting, or new product applications. Just be sure that it’s not too loud. You want the televised content to supplement your overall exhibit, not act as the centerpiece. 12. Who Have You Helped? Has your product or company helped anyone that you’re especially proud of, or that you think would really resonate with people? Don’t be shy with it. Use it as a component in your exhibit, preferably as a photo with a short blurb if needed. People are emotionally affected by seeing others helped in precisely the same way as when we’re helped by someone ourselves. This gives you the chance to powerfully associate yourself with service to others during your trade show interactions. And we can’t think of a single product or industry that wouldn’t benefit from that. Your trade show display, aside from your product and company, is your central asset at any event. People can sense a dull or unenthused exhibit before they’ve even set foot in it. By investing effort and creativity upfront and following this trade show display ideas, you massively increase your odds of success. Make the booth look like it’s the main stage and you’ll surely get noticed. Put some cameras pointing at the booth for example – triggers attention for sure!